Neptunite: Mineral information, data and localities. 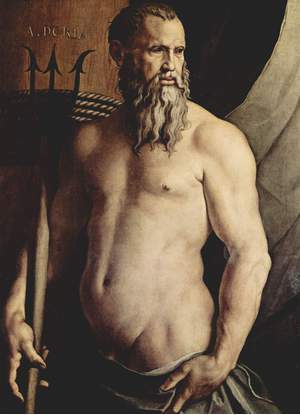 For Neptune, Roman god of the sea, for close association at type locality with aegirine (named after Aegir, a Scandinavian sea god). Visit gemdat.org for gemological information about Neptunite. Benitoite 327 photos of Neptunite associated with Benitoite on mindat.org. Natrolite 230 photos of Neptunite associated with Natrolite on mindat.org. Joaquinite-(Ce) 104 photos of Neptunite associated with Joaquinite-(Ce) on mindat.org. Crossite 28 photos of Neptunite associated with Crossite on mindat.org. Djurleite 10 photos of Neptunite associated with Djurleite on mindat.org. Albite 7 photos of Neptunite associated with Albite on mindat.org. Joaquinite Group 5 photos of Neptunite associated with Joaquinite Group on mindat.org. Glaucophane 4 photos of Neptunite associated with Glaucophane on mindat.org. Microcline 2 photos of Neptunite associated with Microcline on mindat.org. Bario-orthojoaquinite 2 photos of Neptunite associated with Bario-orthojoaquinite on mindat.org. 14.9.3 Lintisite LiNa3Ti2(Si2O6)2O2 · 2H2O Mon. 14.9.7 Ohmilite Sr3(Ti,Fe3+)(Si4O12)(O,OH) · 2-3H2O Mon. 14.9.14 Strontiojoaquinite Sr2Ba2(Na,Fe)2Ti2[Si4O12]2O2(O,OH)2 · H2O Mon. 14.9.15 Bario-orthojoaquinite (Ba,Sr)4Fe2Ti2[Si4O12]2O2 · H2O Orth. 14.9.16 Strontio-orthojoaquinite (Na,Fe)2Sr2Ba2Ti2[Si4O12]2O2(O,OH)2 · H2O Orth. 14.9.19 Delindeite (Na,K)2(Ba,Ca)2(Ti,Fe,Al)3(Si2O7)2O2(OH)2 · 2H2O Mon. 14.9.25 Tisinalite Na3H3(Mn,Ca,Fe)TiSi6(O,OH)18 · 2H2O Trig. 14.9.38 Koashvite Na6(Ca,Mn)(Ti,Fe)Si6O18 · H2O Orth. Hlawatsch, C. (1909), Bemerkungen zum Aragonit von Rohitsch, Natrolit, und Neptunit von S. Benito: Tschermaks Mitt. : Band 28, pp. 293-296, 1909. Bradley, W.M. (1909), On the analysis of the mineral neptunite from San Benito County, California: Am. Jour. Sci., 4th. Series: 28: 15-16; & Zeitschr. Kristallographie, band 46: 516-517 (1909). Ford, William Ebenezer (1909), Neptunite crystals from San Benito, California: Am. Jour. Sci., 4th. Series: 27: 235-240; …Zeitschr. Kristallographie, Band 46: 321-325 (1909). Schaller, Waldemar Theodore (1911), Notes on neptunite: USGS Bull. 490: 55-57. Schaller, Waldemar Theodore (1911), Krystallographische Notizen ueber Albit, Phenakit, und Neptunit: Zeitschr. Kristallographie, Band 48: 550-558; …USGS Bull. 490: 53-56 (1911). Berry, Leonard G. (1963b), Neptunite: unit cell and X-ray powder data: Canadian Mineralogist:7: 679-681. Cannillo, E., F. Mazzi & G. Rossi (1966), The crystal structure of neptunite: Acta Crystallographica: 21: 200-208. Bancroft, G.M., R.G. Burns & A.G. Maddock (1967), Oxidation state of iron in neptunite from Mossbauer spectroscopy: Acta Crystallographica: 22: 394-395. Laird, J. & A.L. Albee (1972), Chemical composition and physical, optical, and structural properties of benitoite, neptunite and joaquinite: American Mineralogist: 57: 85-102. Tschermaks Mineralogische und Petrographische Mitteilungen (1982): 30: 237-247. Physics and Chemistry of Minerals (1991): 18: 199. American Mineralogist (1993): 78: 237. 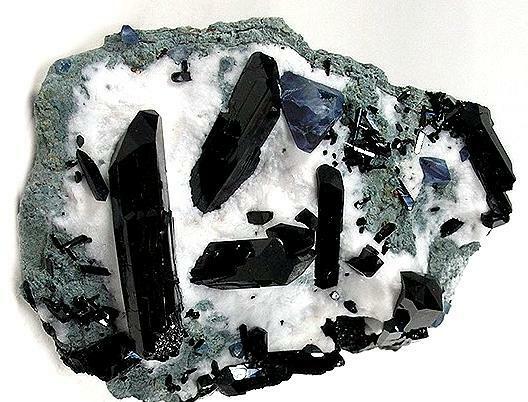 The following Neptunite specimens are currently listed for sale on minfind.com. Slansky, E., Glen, R.A. (1981) Neptunite from the Woodsreef Serpentinite, New South Wales: A New Occurrence (A Preliminary Communication), Geological Survey of New South Wales, GS1981/231. Tschermaks Mineralogische und Petrographische Mitteilungen 30, 237-247. William Heinrich, E. & Quon, Shi H. (1963): Neptunite from Seal Lake, Labrador. Canadian Mineralogist 7, 650-654. ; Nickel, E.H., J.F. Rowland, and D.J. Charette (1964) Niobophyllite - the niobium analogue of astrophyllite; a new mineral from Seal Lake, Labrador. Can. Mineral., 8, 40-52. GSC database; GSC database locality No. 4101; Cámara, F., Sokolova, E., Hawthorne, F. C., Rowe, R., Grice, J. D., & Tait, K. T. (2013). Veblenite, K2〈 2Na (Fe2+ 5Fe3+ 4Mn2+ 7〈) Nb3Ti (Si2O7) 2 (Si8O22) 2O6 (OH) 10 (H2O) 3, a new mineral from Seal Lake, Newfoundland and Labrador: mineral description, crystal structure, and a new veblenite Si8O22 ribbon. Mineralogical Magazine, 77(7), 2955-2974. Flink, G. (1893): Om några mineral från Grönland. Geologiska Föreningen i Stockholms Förhandlingar. 15, 195-208; Petersen, O. V & Johnsen, O. 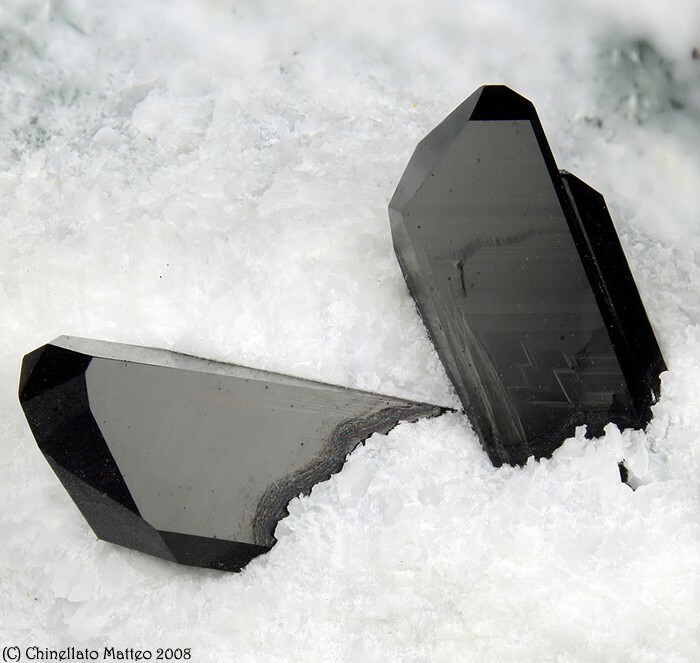 (2005): Minerals first described from Greenland. Canadian Mineralogist, Special Publication. 8, 184p. Petersen, O. V. & Johnsen, O. (2005): Mineral species first described from Greenland. Canadian Mineralogist, Special publication no. 8. Bøggild, O.B. (1953): The Mineralogy of Greenland. Meddelelser om Grønland, Reitzels Forlag København. Bd. 149. Nr. 3. 445 pages. ; Sørensen, H. (1962): On the occurence of Steenstrupine in the Ilimaussaq massif, southwest Greenland. Meddelelser om Grønland. 167. Reitzels Forlag København. 251 p.
Nockolds, S. R. (1950): The occurrence of neptunite and eudialyte in quartz-bearing syenites from Barnavave, Carlingford, Ireland. Mineralogical Magazine 29, 27-33. U. Kempe, J. Götze, S. Dandar and D. Habermann (1999) Magmatic and Metasomatic Processes During Formation of the Nb-Zr-REE Deposits Khaldzan Buregte and Tsakhir (Mongolian Altai): Indications from a Combined CL-SEM Study. Mineralogical Magazine 63:165-177.; Kempe, U., Möckel, R., Graupner, T., Kynicky, J., & Dombon, E. (2015). The genesis of Zr–Nb–REE mineralisation at Khalzan Buregte (Western Mongolia) reconsidered. Ore Geology Reviews, 64, 602-625. Bailey, J. C: Formation of cryolite and other aluminofluorides: A petrologic review. Bull. geol. Soc. Denmark, vol. 29, pp. 1-45. Copenhagen, June 10th, 1980.; Vladykin, N. V., & Sotnikova, I. A. (2017). Petrology, geochemistry and source characteristics of the Burpala alkaline massif, North Baikal. Geoscience Frontiers, 8(4), 711-719. Zadov, A.E., Gazeev, V.M., Karimova, O.V., Pertsev, K.N., Pekov, I.V., Galuskin, E.V., Galuskina, I.O., Gurbanov, A.G., Belakovsky, D.I., Borisovsky, S.E., Kartashev, P.M., Ivanova, A.G., Yakubovich, O.V. (2011): Magnesioneptunite KNa2Li(Mg,Fe)2Ti2Si8O24 - a new mineral of the neptunite group. Zapiski Rossiiskogo Mineralogicheskogo Obshchestva (Proceedings of the Russian Mineralogical Society), 140(1), 57-66 (in Russian). English translation: Geology of Ore Deposits, 53, 775-782. Arzamastseva, L.V., Pakhomovsky, Ya.A. [Арзамасцева, Л.В., Пахомовский Я.А.] (1999): Mineral associations in rocks of Niva agpaitic intrusion (Kola Peninsula) as indicators of its forming conditions [Минеральные ассоциации пород агпаитовой интрузии Нива (Кольский Полуостров) как индикаторы условий ее образования]. Zap. VMO [Зап. ВМО], 128, 6, 1-16 (in Russian); Arzamastsev, A.A., Belyatsky, B.V., Arzamastseva, L.V. (2000): Agpaitic magmatism in the northeastern Baltic Shield: a study of the Niva intrusion, Kola Peninsula, Russia. Lithos, 51, 1, 27-46. Agakhanov, A.A., Pautov, L.A., Uvarova, Y.A., Sokolova, E.V., Hawthorne, F.C., Karpenko, V.Yu. (2005): Senkevichite, CsKNaCa2TiO[Si7O18(OH)], a new mineral. New Data on Minerals, 40, 11-16; Agakhanov A.A., Pautov L.A., Karpenko V.Yu., Bekenova G.K., Uvarova Y.A. (2011) Orlovite, KLi2 TiSi4 O11F, a new mineral of the mica group New Mineral Data 46:13-19; Agakhanov, A.A., Pautov, L.A., Sokolova, E., Hawthorne, F.C., Karpenko, V.Yu., Siidra, O.I., Muftakhov, V.A. (2016): Odigitriaite, CsNa5Ca5[Si14B2O38]F2, a new cesium borosilicate mineral from the Darai-Pioz alkaline massif, Tajikistan: Description and crystal structure. Mineralogical Magazine, 80, (in press). 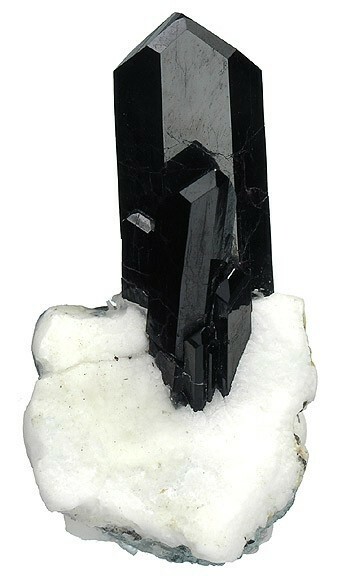 www.mineralsocal.org; William S. Wise (1982) Strontiojoaquinite and bario-orthojoaquinite: two new members of the joaquinite group . American Mineralogist 67:809-816. Joseph F. Cooper Jr., Gail E. Dunning, Ted A.Hadley (2003) Minerology of the Victor Claim, Clear Creek Area, New Idria District, San Benito County, California. Pemberton, H. Earl (1983), Minerals of California; Van Nostrand Reinholt Press: 467. Chakhmouradian A.R., Mitchell R.H. (2002): The mineralogy of Ba- and Zr-rich alkaline pegmatites from Gordon Butte, Crazy Mountains (Montana, USA): comparisons between potassic and sodic agpaitic pegmatites. Contrib. Mineral. Petrol., 143, 93-114.